The question of how the key building blocks required for chemical, and later, biological evolution were first formed on the early earth remains unclear. 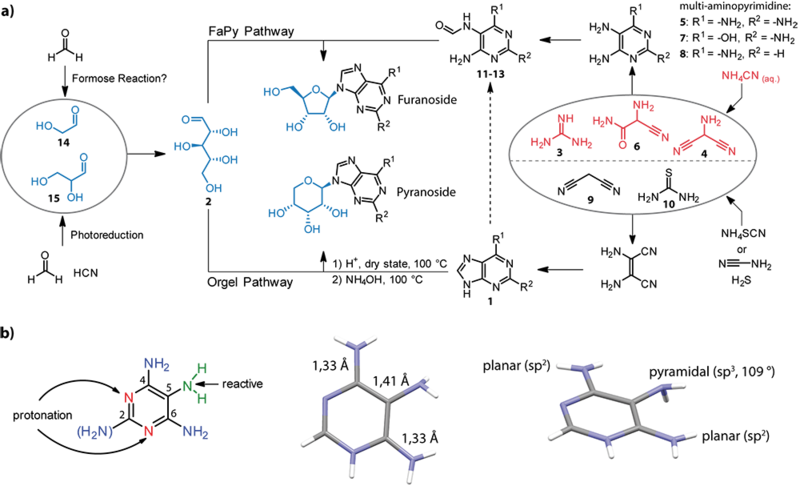 The Carell group aims to discover conditions, pathways, and reaction mechanisms via which the purines and pyrimidines could have plausibly originated. The chemistry we explore makes use of natural processes such as wet-dry cycles, as well as prebiotically plausible starting materials such as HCN, malonitrile, CO, H2O, NaNO2, formaldehyde, glycolaldehyde, formic acid and formamide. Depiction of a prebiotically plausible reaction pathway that leads to the formation of purine nucleosides. The starting materials are glycolaldehyde, formaldehyde, NH4CN, NH4SCN and malonitrile. We have recently discovered a novel pathway affording purine nucleosides, and demonstrated that under similar conditions, pyrimidine nucleosides can be generated in high yields and with excellent purities in parallel. Our current research is thus concerned with the prebiotic origins of DNA and RNA. Future research will aim to decipher how the nucleic acid and protein worlds subsequently evolved.